The First World War is often viewed as a monstrous conflict that consumed vast amounts of materiel and men in grand battles, fought by titanic armies, which in turn changed the course of history. It is regarded as a war of numbers. However, amongst the multitude of undoubtedly impressive, but deeply ambiguous, statistics hides an obvious truth: The war was fought by individuals – individuals whose realities are too often lost in the sheer magnitude of events. The industrial nature of the conflict required that it was also a war of objects, and two items of this unique material culture aptly portray the complexity of the First World War paradigm. Today, on the old frontlines, stand two magnificent statues, a little over twenty miles apart, which together tell the story of an industrialised war and the individual’s experience of it. Characteristic of the way the conflict is invariably viewed, the Newfoundland Regiment is perhaps best known for its attack on the German lines at Y-Ravine near Beaumont Hamel, on the morning of the 1st July 1916. In less than half an hour the 1st Battalion of the Regiment was virtually wiped out, suffering 75% casualties and ensuring their place in the epic history of the Battle of the Somme. Today, on the site of that attack, one that so typified the effects of mechanical war on the human body, rests the Newfoundland Memorial. At its centre stands the emblem of the Regiment – a magnificent, bronze caribou, forever guarding the memory of that summer’s morning. It is an impressive object that embodies the Newfoundlanders’ spirit, as well as the tiny dominion’s commitment to the war. 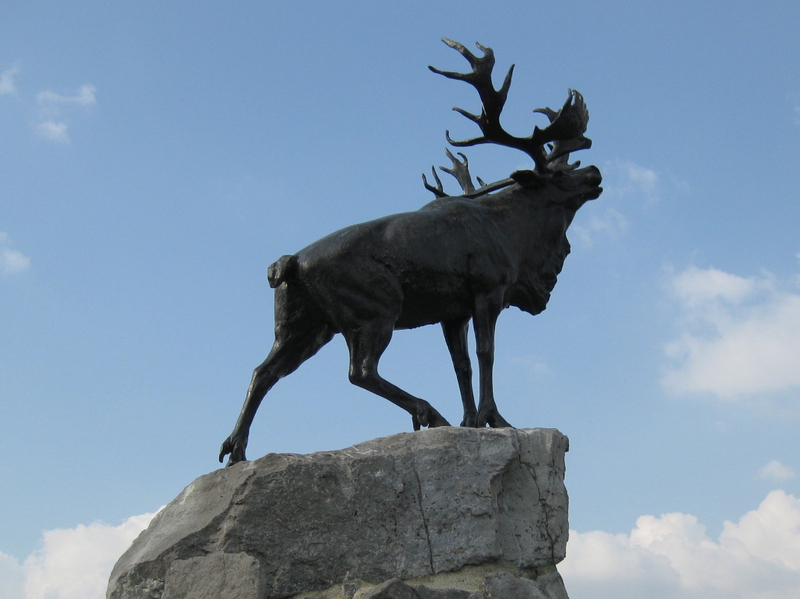 Nine kilometres to the east of Arras stands another of these bronzed caribou (there are five to be found across France and Belgium). This proud beast commemorates the lesser known, but no less valiant, stand by a handful of Newfoundlanders on 14th April 1917, during the Battle of Arras. On that day, at dawn, the Newfoundlanders, with the 1st Essex Battalion on their left, advanced from their lines at Monchy le Preux towards their objective of Infantry Hill. Despite initial success, the Newfoundlanders soon found themselves trapped in front of the hill. There they were attacked from three sides by a sequence of murderous German counter-attacks. Under the relentless pressure the Newfoundland and Essex lines split and the survivors were reduced to small groups, fighting desperate skirmishes against overwhelming odds. Many were killed and the rest were forced to surrender. The losses that day were appalling, with the Essex losing 602 men and the Newfoundlanders 460, 159 of which were killed. With figures on this scale it is perhaps not surprising that to many the conflict is seen as a war of numbers, one where the role of the individual is subverted. But as is so often the case, these harrowing casualty figures do not tell the whole story. 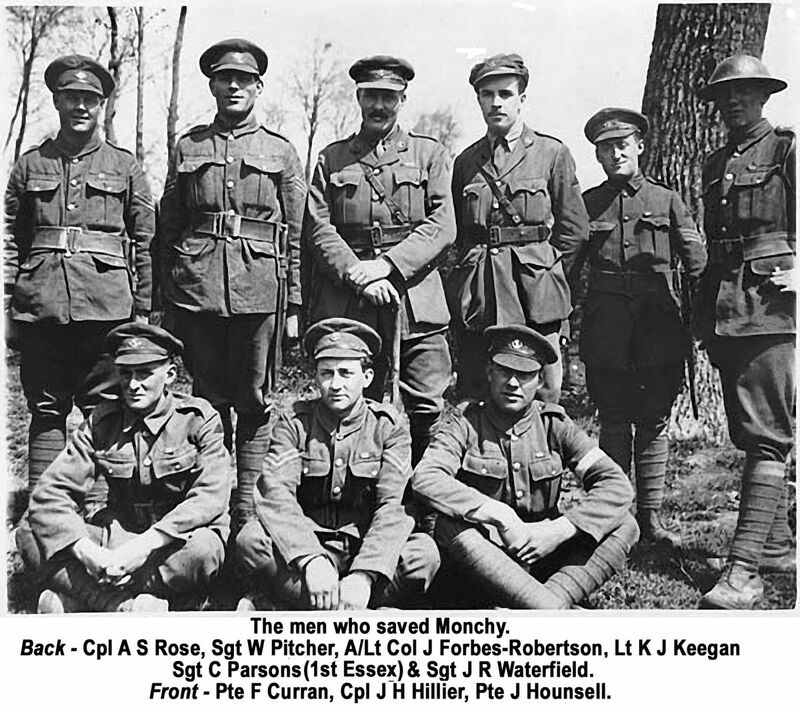 Emboldened by the obvious success of their counter-attacks, the Germans began to advance on Monchy le Preux. The allied attack had not only become a disaster, but now it was in danger of contributing to a reverse. It was at this point, in a mechanised war of materiel, that the course of the battle was determined. Not by a grand army, but by a handful of individuals. Alerted to the danger, the Second in Command A/Lt Col Forbes-Robertson (who was temporarily commanding the battalion) led a group of 10 officers and men from the battalion headquarters, along with a surviving member of the Essex, towards the advancing Germans. Concealed behind a bank and despite the fact that they were impossibly outnumbered, they engaged the attackers. The ferociousness of their fire was so intense that the Germans became convinced a far larger force opposed them and their attack began to falter. For four hours the small band kept as many as 500 of the enemy at bay, deliberately picking off scouts and look-outs, ensuring that the truth of their small number remained undetected. Eventually, the intrepid group were relieved by reinforcements, their incredible display of bravery having saved the village of Monchy le Preux, a vitally important part of the Arras battlefield. 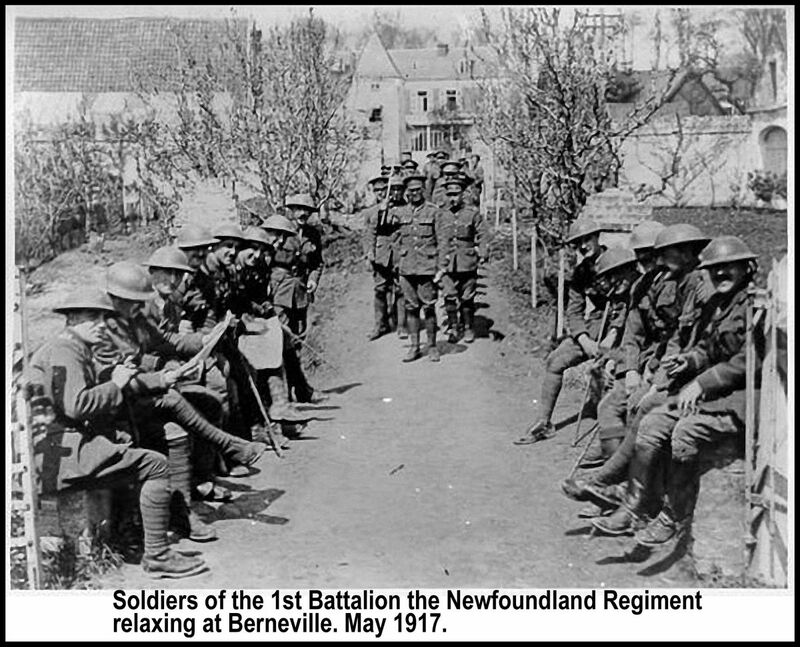 The suffering experienced by the Newfoundlanders that day did not end with the sound of gunfire. 153 had been captured during the battle and these men were promptly taken to an old fort near Lille, imprisoned under dreadful conditions and virtually starved to death. After a month they were sent to other prison camps, but not before 26 of their number had died in captivity. Along with all British prisoners, they had been declared ‘Prisoners of Reprisal’ in response to the British ignoring a German request for POWs to be kept at least 30km behind the lines. The great battles of the war, and the casualties they inevitably entailed, are rightly remembered. But their commemoration forms part of the memorial layer that now covers the Western Front, unintentionally disguising events that were of equal worth, but are too often forgotten. It is part of the archaeology of the conflict and nowhere is this more epitomised than at Beaumont Hamel, where the eternal cries of the Newfoundland Regiment mix with the many others that silently ring out across the Somme. The bronze caribou that proudly guards the village of Monchy le Preux, steadfastly looking out towards the base of Infantry Hill, highlights the complexities and ambiguities of the First World War. It may indeed have been a colossal struggle of ideologies and armies, but amongst the terrible cost of industrial conflict, it was a war fought by individuals, and it is they that changed the course of history. 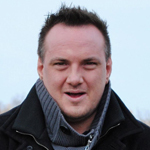 Dr Matthew Leonard is a modern conflict archaeologist and the author of Poppyganda, published by Uniform Press. His PhD research concerned the engagement of man and the underground worlds of the Western Front during the First World War. As a conflict archaeologist, his research adopts a modern interdisciplinary approach, incorporating elements of anthropology, military history and archaeology. He is using this framework to explore how these subterranean landscapes, which themselves are a distinctive kind of conflict landscape with their own repertoire of material culture of the Great War, were created and experienced, and how existentialism, sensorial interaction and the human body coped with and mediated the extreme pressures of war life underground. Matthew is a member of the Durand Group and carries out frequent fieldwork in France beneath the battlefields of the First World War. As part of a select group of academics, he is helping to advise the BBC on their television, radio and online coverage of the anniversary of the war. He is also a contributor to the edited volume Beyond the Dead Horizon: Studies in Modern Conflict Archaeology and a regular feature writer for Military History Monthly. More information concerning Matthew's research can be found on his website www.modernconflictarchaeology.com. This entry was posted in The Battle of Arras and tagged 356 (Foot forces & warfare), Blogs. Bookmark the permalink. ← August 1914: England’s Difficulty, Ireland’s Opportunity?